The Communication and Creativity program is intended to enhance young people’s self-esteem by achieving creative and mobilizing projects. 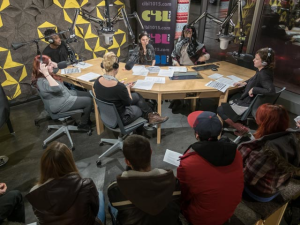 Inclusive and open to diversity, the Radio Anonyme radio show brings together every week young people from ages 14 to 30 to give them the opportunity to learn the basics of radio broadcasting and develop various skills. During the radio programs, which run from September to May, they will talk about various social issues and topics that captivate or concern them, in addition to airing their favourite music. 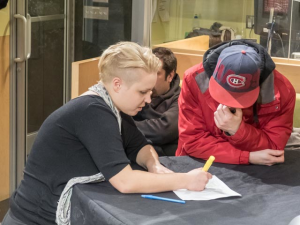 For its 10-year anniversary, Radio Anonyme is collaborating with CHOC.ca, the radio station of the Université du Québec à Montréal, who will welcome us in its state-of-the-art studios in September 2017. The participants will benefit from the expertise of the CHOC.ca team, while assisting to live radio broadcasting. 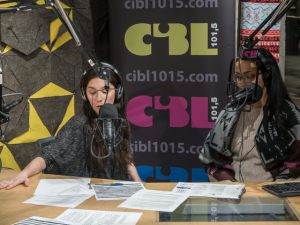 Radio Anonyme will therefore pursue its mission of giving to young people a space for talking, while also providing an opportunity for the city’s community organizations to promote their services through special radio shows. In collaboration with Station vu – Cinéma de quartier and Tous les Enfants de l’Autre Monde (T.E.A.M. ), L’Anonyme will allow six young people to produce a documentary in Lima, the capital of Peru, during a 6-day trip in July 2017. The film will be produced entirely by them and will examine in depth the reality of the children and youth who have lived or still live on the streets in the neighbourhoods surrounding Lima. This requires the selected young people to produce a monthly radio show on topics related to their experience to come. A few months before their departure, participants will take a film training of about 30 hours provided by Station Vu, in collaboration with Carole Laganière, Montréal filmmaker. Also, two other training will allow them to bond and to learn more about the culture, the habits and the reality of the children and youth of the streets of Peru.